It leverages the convexity/beta slippage concept of buying high after advances, and selling low after declines to benefit the portfolio. Both SPY and TLT assets tend to trend over long-term horizons. There is a persistent negative correlation between the two underlying assets (SPY and TLT). To make clear how convexity helps us in this strategy let's discuss points #1 and #2. Consider the situation in which SPY is trending up. The leveraged ETF UPRO must buy more stocks as SPY advances gaining more and more exposure to the market as it gains compounding our returns much faster than SPY. This situation also works in reverse as SPY trends down. We will sell more and more stocks at a faster rate than SPY as SPY declines. The same holds true for TLT. the assets are persistently negatively correlated such that most of the time when one asset is losing value the other is gaining. the asset that is gaining is trending/gaining more than the the asset that is losing. Nothing groundbreaking there right? Well if the aforementioned is true then it is critically important to examine the relationship between the underlying ETFs and determine (1) how negatively correlated are they? (2) how persistent is their negative correlation (3) how much of the time are they positively correlated? We well look for answers to those questions now. **Data is sourced using the Yahoo Finance API. The dataset ranges from 7/31/2002 until 4/21/2016 covering almost 14 years so it is a somewhat "shorter" long-term time frame. Examining a simple linear regression of returns shows a distinct negative correlation of -0.42. Additionally we can see how persistent (yet unstable) the negative correlation has been on a 252 day rolling basis. 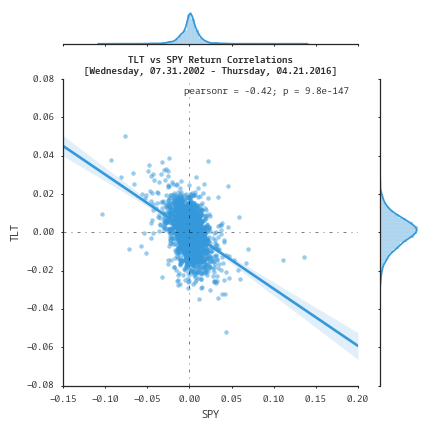 Now let's examine the conditional returns of TLT given that SPY returns are negative (< 0). Below you can see how often TLT returns are positive when SPY returns are negative. Most importantly this relationship shows strength during the 2008 financial crisis. In the second plot below I show the cumulative returns of this relationship. Over time we can see that the TLT has gained as SPY as declined. 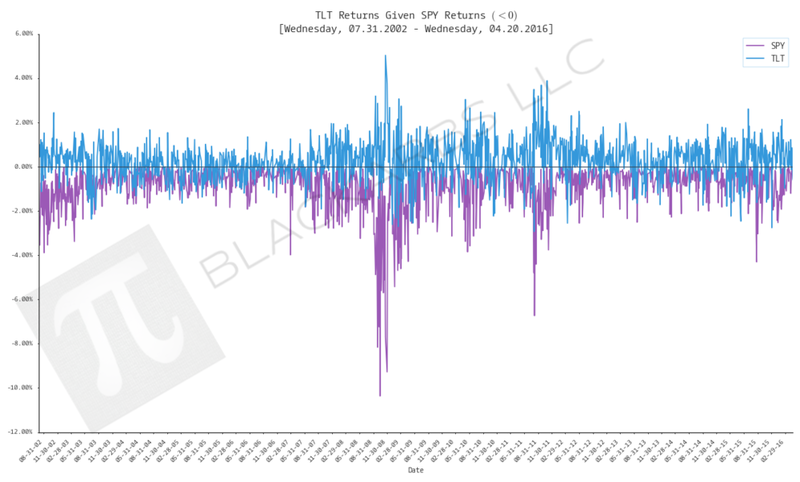 Let's examine the conditional returns of TLT given that SPY returns are positive (> 0). Below we can see how the plots are near mirror images of the above. One thing to note is that is the plot below left shows that there is more overlap between TLT and SPY returns when SPY returns are positive than the opposite shown above. This is an indication that both SPY and TLT are more likely to have positive returns when the market is gaining. The cumulative return plot shows the strength of this relationship. Finally let's examine the percentage of time that both ETFs had concurrent positive and negative returns. This confirms our interpretation of the above plots. There are ~56% more instances where both ETFs had positive returns than negative. Overall, the ETFs have moved in opposition ~62% of the time. When combined with the concurrent positive returns, the ETFs have had a favorable relationship (from the strategy perspective) ~85% of the period studied. Historically, we can say that the "Dead Simple 2-Asset" leveraged ETF strategy has worked because the underlying maintains a relationship that is persistently negatively correlated, and more likely to move together when the market is advancing (a bonus) than when the market (SPY) is declining. This is a striking result because it means that the efficiency of TLT as a hedge increases as the market trends down. Furthermore, the trending nature of these two assets means that the portfolio takes advantage of the convexity inherent to rebalancing leveraged ETFs compounding returns faster than the underlying. Is there a way improve the strategy moving forward such that we aren't exposed to those periods of increasing positive correlation since we do not know if those periods will be positive or negative? Fortunately, I believe I have found an implementation which gives us the best of both worlds. I will discuss the strategy in the next installment of the series.